Will There Be Justice for NYPD Victim Ramarley Graham? How the shooting death of the unarmed teenager sparked new activism against police violence in the Bronx. At around 3 pm on a Thursday afternoon in February 2012, 18-year-old Ramarley Graham was leaving a Bronx bodega with his friends, when he was followed by members of the Street Narcotics Enforcement Unit of the 47th Precinct of the New York Police Department. Footage from his home’s surveillance camera shows that Ramarley approached the door of his house, in the Wakefield section of the Bronx, unlocked it and walked inside. An officer then ran to the door, followed by another, gun drawn, and tried to kick it in without success. Multiple officers swarmed the house, entering through the back without a warrant and letting others in through the front. Officers at the bodega radioed their suspicion that Ramarley was armed. Rather than moving with caution and calling for backup, NYPD officers broke through a series of doors, following Ramarley upstairs and into his bathroom. According to Officer Richard Haste, he yelled “Show me your hands!” before Ramarley reached for his belt. Shouting “Gun! Gun!” Haste then shot Ramarley in the chest, killing him. No weapon was found, only a small bag of marijuana which investigators hypothesized Ramarley had been attempting to flush down the toilet. Ramarley Graham was one of at least twenty-one people killed by the NYPD in 2012, according to the Stolen Lives Project, a project of the October 22 Coalition, whose members mine news articles and reach out to the community seeking examples of deaths at the hands of police. In 2013 so far, twelve people have been fatally shot by NYPD, including 16-year-old Kimani Gray this past March. Stolen Lives estimates that since Amadou Diallo was killed in 1999, unarmed and fired upon forty-one times outside his apartment building, at least 238 people have been killed by NYPD—the majority black or Latino men or teenagers. Setting Ramarley Graham’s case apart from most was the indictment of his shooter, then 31, who was charged with manslaughter, first and second degree. It was the first indictment of an on-duty NYPD officer for such a shooting since 2007, when three detectives were indicted, and later acquitted, for killing Sean Bell, also in the Bronx. A 23-year-old father, Bell had been out celebrating on the eve of his wedding when killed. Haste pleaded not guilty, just as the detectives in the Bell case did. Since their son’s death, Ramarley’s parents, Constance Malcolm and Franclot (Frank) Graham, have been fighting tirelessly for answers and accountability. The raid on the family’s home was traumatic; Ramarley’s little brother Chinnor, now 7, was in the house, along with his grandmother, Patricia Hartley, who was taken directly to the NYPD’s 47th Precinct Station House and interrogated for seven hours. Beginning shortly after Ramarley’s funeral, which included the Reverand Al Sharpton as a speaker, Malcolm and Graham held eighteen weekly vigils outside the house where he died, one for each year of his life. They also created the organization Ramarley’s Call, which meets weekly to strategize rallies and participation in other anti-police brutality events. “With no great pleasure, I’m obliged in this case to dismiss the charges,” Judge Barrett told the court, adding that his ruling did not establish that Haste had acted with justification, and that the DA had the right to reconvene a grand jury. But on August 7, a reconvened grand jury decided not to re-indict Officer Haste. Outraged by the news, the next day Malcolm and Graham held a rally outside DA Robert Johnson’s office, where they were joined by Councilmembers Jumaane Williams of Brooklyn and Andy King of the Bronx, as well as Comptroller John Liu, Tamika Mallory of the National Action Network (NAN), along with friends, family, and supporters. “I’m just lost right now,” said Graham tearfully. “I’ve got so much pain and anger inside of me.” The family has initiated a petition calling for the Department of Justice to open an investigation into the case. Another protest two days later was held in front of the 47th Precinct Station House in the Bronx, and Ramarley’s parents plan to participate in the upcoming march on Washington with NAN, this coming Saturday, August 24. “We have to ask ourselves this question,” Graham implored the crowd outside the DA’s office on August 8. “Had Ramarley been white, would this have happened? Would they have run into a white person’s home?” The question echoed the hypothetical offered by President Obama in response to the acquittal of George Zimmerman in July: Had Trayvon Martin been of age and armed, would he have been allowed to stand his ground? The answer to these imagined scenarios clarifies reality: our system judges these murders not as injustices. As tragedies, maybe. Just as important, we need to ask ourselves how these murders even occurred—how they developed from the seed of subjective suspicion to a teenage life prematurely taken—and what this has to do with the way race operates in our criminal justice system. When Constance Malcolm emigrated to New York from Jamaica at 13, she lived just down the block from the house where Ramarley was shot. Following his death, she traveled back to Jamaica for a few weeks, using the plane ticket she and Graham had planned to give their son for his birthday the following month. Malcolm is frustrated with these and other intimations of guilt. Even today, some media continue to report that Ramarley was running toward his door, when the video footage clearly shows him walking. 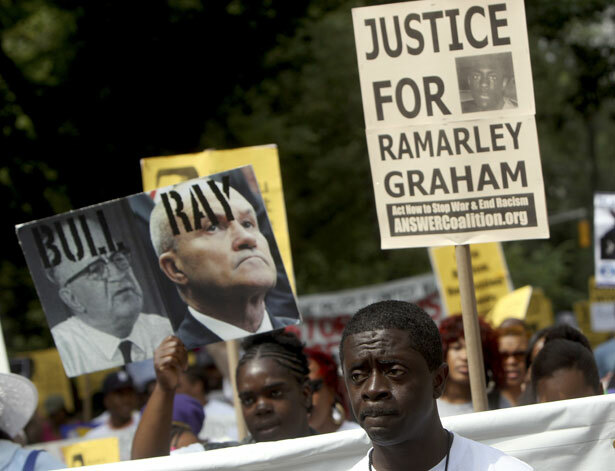 The criminalization of Ramarley Graham is typical of media narratives involving black victims of police violence. When 16-year-old Kimani Gray was gunned down by the NYPD in East Flatbush this past March, headlines described him as a “gang member,” a label with no clear basis, and one still contested by his family. After protests erupted in the neighborhood following the killing, media coverage shifted the spotlight from police accountability to stories demonizing the community or scrutinizing infighting among leftist activists who rallied to the cause. With the landmark and long anticipated ruling in Floyd v. the City of New York on August 12, the racism of the NYPD’s stop-and-frisk policy has attracted overwhelming media attention by comparison. And with good reason: In 2011 alone, of the 685,724 people stopped by police, 84 percent were black or Latino, the vast majority young men. (The total number of stops jumped from 97,000 in 2002.) Only 6 percent of stops led to arrests, less than 2 percent to seizures of contraband, and a tenth of 1 percent to seizures of guns, according to the Center for Constitutional Rights. Meanwhile, the constant police presence in communities of color, including, often, in schools, has long been known among residents as “The Occupation.” Beyond issues of civil liberties violated, when police-community relations are eroded, no one is safer. For their part, Mayor Michael Bloomberg and his police commissioner, Ray Kelly, have been hostile to notions that police policies criminalize communities of color. If anything, Kelly has claimed that “African-Americans are being understopped.” He and Bloomberg justify stop-and-frisk arguing that black and Latino men commit the majority of violent crimes. But data shows that even after controlling for crime rates, stops are still discriminatory, Judge Scheindlin found. This is key. Further, a little less than three-fourths of stops made last year were listed by NYPD as suspecting “nonviolent” offenses (like weapons possession, larceny, pot possession and criminal trespass). In response to the ruling in Floyd, Bloomberg said that “It’s a dangerous decision made by a judge who doesn’t understand how policing works,” and that he plans to appeal the decision. Denying discrimination, as Bloomberg does, without acknowledging how race has historically functioned in American society’s most basic structures and deeply ingrained consciousness is to ignore the inherited effects of our past, recent and long-standing. To truly address issues like the violence the mayor so glibly ascribes to communities of color, it would be necessary to examine the decades of policy that create the conditions—the poverty, the lack of options, the anger—that disrupt communities in the first place. It would mean remembering how such institutions as the Federal Housing Administration, from its inception in 1934, resulted in legally sanctioned racial segregation and isolation of the ghetto poor for decades to come. It would mean examining how the 1944 GI Bill explicitly excluded people of color and discriminated against black veterans. And when it comes to contemporary policies, it would mean looking at the racist roots of the foreclosure crisis, the pushback against Medicaid expansion and much more. And of course it would mean grappling with mass incarceration. On this front, at least, Attorney General Eric Holder has given some reason to hope: drug offenders make up more than half of the federal prison population. Data consistently shows that people of color are not statistically more likely to be involved in drug usage or sales So why are thousands of people of color like Tyquan Brehon—who was stopped more than sixty times by his eighteenth birthday—being harassed, or worse, without explanation? It was “something about how he moved his hands near his waist,” reported The New York Times soon after Ramarley’s murder, that “led the officers to suspect he might be armed.” Why officers used a narrow tactical radio frequency to communicate a suspected weapon­—rather than issuing a more heavily trafficked channel warning, drawing other officers to the scene—remains a question. While the Times explicitly describes scrutiny of the narcotics unit’s actions, the article also inadvertently highlights the central issue of racialized stop-and-frisk: the expansive discretion the criminal justice system gives police officers in determining and pursuing suspicion. Terry vs. Ohio (1968) is the Supreme Court case that established the constitutionality of stop-and-frisk—sometimes called “Terry stops”—in cases where police have “reasonable suspicion” that “criminal activity may be afoot.” What exactly constitutes “reasonable suspicion,” of course, is an immense gray area. But in the larger context of a racialized criminal justice system, race becomes a proxy for criminal activity. As Michelle Alexander argues in her influential 2010 The New Jim Crow, contemporary mass incarceration in the United States—the highest rate of incarceration in the world, mostly due to drug-related convictions—is a form of race-based societal repression and social control. Even if only briefly in jail, the once-incarcerated are branded and denied basic rights, making their successful re-entry into mainstream society extremely difficult. Mass incarceration creates a racial caste of undesirables, Alexander argues, who are legally, and often permanently, excluded from society. Narcotics teams like the one that followed Ramarley stop teenagers in his neighborhood all the time. The choice to patrol certain areas more than others creates a circularity in argument that many people still don’t recognize. Naturally, heavily patrolled areas will produce more arrests and therefore higher crime statistics than those of areas less heavily patrolled. In this context, it’s pointless to cry or deny “racist!” on an individualist, case-by-case basis. This is a systemic problem that demands structural change. Alexander’s book also chronicles the way in which the Supreme Court has both aided and abetted the drug war, greasing the wheels of mass incarceration, but also making it more difficult to challenge its racist effects. Perhaps the most egregious example was the 1987 Supreme Court ruling in McCleskey v. Kemp, pertaining to sentencing. Warren McCleskey, a black man sentenced to death without physical evidence for killing a white police officer, appealed his conviction using statistical evidence that Georgia’s death penalty was carried out in a racially discriminatory manner. In its ruling denying his appeal, the court set a precedent that would make it virtually impossible to prove that criminal justice policies have a broad racial bias. Racial bias in sentencing, the justices ruled, even if demonstrated through statistical evidence, cannot be challenged under the Fourteenth Amendment without evidence that it is the result of conscious, discriminatory intent. No successful challenge to racial bias in sentencing has been made since. In New York and beyond, activists, many of them formerly incarcerated, and organizations like the Stop Mass Incarceration Network, founded by Cornel West and Carl Dix, as well as the Campaign to End the New Jim Crow have taken up Alexander’s rallying cry for a mass social movement. The new activism follows organizing against police brutality that built substantial strength in the late 1990s, galvanized in part by Amadou Diallo’s death at the hands of the NYPD in 1999 (and the acquittal of the four officers in 2000). The trauma of 9/11 and subsequent adulation of police—even as the NYPD would take unprecedented steps to bolster its anti-terrorism task forces, with repressive results—led to the loss of some momentum and redirected the attention of many activists to new, foreign wars. But Sean Bell’s 2006 murder prompted a resurgence in the movement against police brutality. And in the last year, increased funding from donors like the Tides Fund for Fair & Just Policing and others afford organizations like Peoples’ Justice for Community Control & Police Accountability (PJCCPA) the capacity to hire staff, integral to the movement’s potential. Among other things, PJCCPA knits together Cop Watch teams through the city, and was initiated by the NYC Coalition Against Police Brutality, precursor to today’s Communities United for Police Reform (CPR). Today, the unprecedented creation of CPR, a nonpartisan campaign “fighting for reforms that will promote community safety while ensuring that the NYPD protects and serves all New Yorkers,” capitalizes on the work done and relationships made by the police violence movement in the ’90s. Launched in February 2012, CPR unites more than sixty organizations like PJCCPA with community members, lawyers, professors and activists from all five boroughs. The movement that exists today—and a corresponding national awareness of issues like stop-and-frisk, with New York City at its epicenter—is the product of many sectors working separately and together to demand police accountability. It may be that CPR, with its various groups and resources, has made media more responsive to issues of police violence. “It’s not just a group of black or Latino activists claiming that there’s a need for change, it’s a wide cross section of New Yorkers,” Djibril Toure of the Malcolm Grassroots X Movement (MGXM) explains. “I think it’s become a lot more credible of an argument when you see all the different communities coming together, Asian communities, LGBT folks, African-Americans, immigrant communities.” It’s also notable that one effect of the Occupy movement was to bring these issues into a larger, whiter, more mainstream consciousness, as some people were targeted or came into contact with police brutality for the first time. CPR is partly an outgrowth of the Justice Committee (JC), which was founded in the 1980s by former Young Lords Richie Pérez and Vicente (Panama) Alba. The original purpose of the committee, which has developed and expanded in the last decade, was to address police brutality in Latino communities because its leaders felt the media portrayed police violence as a black-and-white issue. Today’s multi-sectored movement is a combination of grassroots community organizing, litigation like that represented by Floyd; legislative initiatives like the Community Safety Act, first introduced by CPR and Councilmembers Jumaane Williams and Charles Barron; researchers and academics at places like John Jay College of Criminal Justice; and, perhaps most significantly, the work of families directly affected by police violence, like that of Ramarley’s parents. Ramarley’s case, especially significant because of Haste’s initial indictment, has become a focal point for other police murder victims, and Malcolm and Graham are central to a growing network of families, throughout New York and across the country. However they define themselves, many families have come to the movement in this way: like Danette Chavis, who started a National Action Against Police Brutality petition on Change.org for her son Gregory Chavis, killed by police in 2004; or Juanita Young, who has been tirelessly speaking out against police murder since her son Malcolm Ferguson’s killing in 2000; or Margarito Rosario, one of the founders of Parents Against Police Brutality and mother of Anthony Rosario, killed by police in 1995; or Adam and Jeralynn Blueford from Oakland, who lost their son Alan just last year. Most cases don’t get an indictment, if they’re lucky enough to be presented before a grand jury at all. The video surveillance footage gave Ramarley’s case the advantage of evidence against the normally omnipotent authority of police account. Many of the organizations I spoke with emphasized the importance of a family-led movement. Groups like Stop Stop and Frisk, FAITH (Fathers Alive In the Hood), Picture the Homeless and the International Socialist Organization, as well as Carlton Berkley, former New York Police Department detective and close friend of the Graham family, and neighbors and community members, activists and sympathetic New Yorkers from across the city have consistently supported Malcolm and Graham, faithfully attending the vigils and rallies held by Ramarley’s Call. When the stop-and-frisk ruling came down on August 12, declaring the practice unconstitutional as carried out in New York, activists celebrated. But they also knew that “winning” the case will be more complicated than the decision handed down by Judge Scheindlin, or even her ordered remedy—a federal monitor who will report to her on issues related solely to stop-and-frisk. “Whatever happens at level of policy or litigation,” explained Yul-san Liem, representative of the JC, “ there’s no way it’s really going to create change in a community unless we have community-based leadership and infrastructure to respond to what’s happening on the ground and hold the police accountable to whatever changes we actually win on the books.” After all, police act illegally on the street today; technically, stop-and-frisk requires the “consent” of the individual stopped. Any real change would necessitate systematically enforced police accountability on the streets. Without community power, implementation of a “win” like the one in Floyd is even less likely. That’s why organizations involved in CPR, like the JC, MXGM, PJCCPA and CAAAV (an organization uniting poor and working-class Asian immigrant and refugee communities, as well as many more), help build grassroots accountability mechanisms in the communities most affected by police violence. There are a number of such initiatives, like Know Your Rights trainings, which educate members of the community about their options in situations from police encounters to arraignments, and the Cop Watch Alliance, which empowers New Yorkers to record and report police officers engaged in inappropriate and illegal activity. Working at the direction of families directly affected, the JC is considering launching a campaign around a broader call for police accountability, to establish an independent prosecutor for cases in which a police officer kills a civilian. The palpable and growing distrust of the NYPD makes many skeptical of the proximate DA’s ability to impartially pursue justice in such cases. Inevitably in a movement like this, those holding conflicting strategic opinions will need to work together. But by ultimately following the leadership of families like Ramarley’s, seasoned activists and community organizers can help to strategize with the communities about how to proceed most effectively. One challenge is convincing people that change is even possible. “The point of the vigils,” Constance Malcolm told me last summer, “is I want people to recognize what has been done to us. And I want to stand up as people, as one, and unite and fight back to let them know, This is enough.” Many New Yorkers, across lines of race, class, age, gender and sexuality, are furious about the NYPD’s practices—and anyone angered by current injustice is encouraged to join the fight. But it’s important to remember that those most likely to pay for their anger are the young people of color living in the communities most heavily targeted by police violence in the first place.